I was sitting behind the stage at this show. 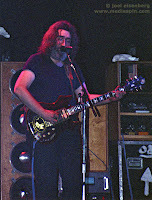 Jerry was facing us, fiddling with his amp or controls when he hit the "magic note," then turned around and the band began in earnest. Part of my delight was watching the folks down in front of the stage erupt in rapturous glee when they realized that St. Stephen was "in the Garden." Having been at Nassau four years earlier for the last Stephen (and last show with Dark Star and St. Stephen the Grateful Dead ever performed) made this one more special. Your review is spot-on in that there is a lot of other good music from this night that is often over-looked. The sweet surprise came the next night with the first performance of Revolution, a delightful 2-night stand at MSG. Hey! Hey! My first tape gets "the treatment!" Spot on, review. The whole pre-drums sequence is a marvel and I blew out a tweeter at a CATS session during that Miracle a couple years back. Also, I love the Space for sentimental reasons and think it's just exactly perfect. Good schtuff! Nice show. These early-80s Birdsongs chained me to the bus forever. I was out in LA by this time, and I distinctly remember stoping some random heads on the Venice boardwalk to pass along the earth-shattering news that "I heard they played St. Stephen and Phil sang!" one little quibble: Steve or Jeff Silberman? thank you, noah! This is one I'd passed on time and again for later ones in the month (Worcester, Hartford, so on), being underwhelmed by the setlist and never being won over by the break-out factor. Looks like it's high time to settle in with this one and make up for some lost time! The discerning listener will note that as the band starts "Fortune comes acalling..." the crowd noise perceptably rises. This is the true seminal moment of this show as its the moment that Phil Lesh steps up to the mike to join the fun after quite the absence. Way cool moment, and one that still amps me up when I hear it all these years later. For anyone ever caught in the "auds v SBDs" argument, where the SBD snob simply can't find a reason why an aud could be superior, I'd simply direct them to this show. I was there that night, and when they dropped into St. Stephen, the roof of the Garden actually lifted off the building. The electricity, the energy was that palpable. And that can ONLY be captured on an audience tape. I was also at this show and had been doing the whole tour (deep into my Dead-touring days at this point). Many of us knew Stephen was likely coming soon. They had sound-checked it at Richmond and many of us listened excitedly with ears pressed to the locked doors of that intimate stadium just days before. They even toyed with it in Space that night. But word quickly spread and the Boys themselves even put out the word to West Coast friends and family that they might want to make the trip out to NY for something special. So it was in the air from the word "go." As amazing as it was (and it was AMAZING! ), I like the Hartford Stephen that followed even more. At that point, everyone who had missed the breakout were eager and praying that they, too, would get to experience a St. Stephen. And so they did. And when that first note hit, the roof flew off once again. There was one more Stephen to follow (for the West Coast) and then no more. Though L.A. almost got one in the 90's apparently, though the show didn't sell out so the Boys decided otherwise. Or so the rumor goes. I was there, too, just in case. Thanks for the memory! 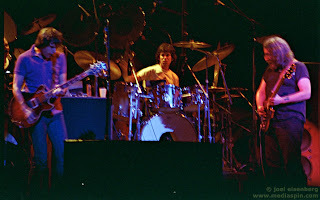 I was ther in Hartford and happened to be standing next to a cop when those first notes were played and the place went beserk and the poor cop was panic stricken! 10/11/83 was at the show with my best friend Adam . Outside the garden he states "the dead are going to play saint stephen tonight. " I reply they dont play that anymore . We make our way to the front row . Out of space comes saint stephen from the front row right beofore our eyes . True story and one of many very special dead moments ! 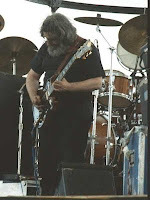 The second set of this show was one of the first Dead recordings I ever had, and it will always hold a special place in my heart for many of the reasons you mention here, especially the pre-drums segment. There is definitely some odd mystical quality to the odd tune placement in that section of the show. I hadn't heard this show in many years and listened to it recently and it still has a unique sound to me.